On 14th May Silversea Cruises announced that it had awarded Fincantieri with an order for another ultra-luxury cruise ship, with delivery scheduled for the fourth quarter of 2021. The contract is valued at over €320 million. Named Silver Dawn, the new vessel will be a sistership of Silversea’s flagship, the 40,791gt Silver Muse, which was launched from the Fincantieri shipyard at Sestri Ponente (Genoa) in April 2017. The order came just months after the cruise line signed a contract with Fincantieri for the construction of the Silver Moon, another sistership to the Silver Muse, which is due to be delivered in 2020. On 10th May 2018 Viking Cruises’ sixth ship, the 47,842gt and 930 guest capacity Viking Jupiter, was floated out, marking a new chapter in the construction process. Scheduled for delivery in early 2019, the arrival of the Viking Jupiter will officially make Viking the largest small ship ocean cruise line in the industry, only four years after launching its ocean business. Just under a month later on 7th June the 47,842gt Viking Orion, the fifth cruise ship built by Fincantieri for Viking Ocean Cruises, was delivered at the shipyard in Ancona. Ten additional ships are also planned for delivery starting in 2021, which could bring Viking’s ocean fleet to 16 ships by 2027. On 21st May P&O Cruises announced that it had marked the first construction milestone for its newest ship with a steel cutting ceremony at the Meyer Werft Shipyard in Papenburg. The ship’s name was announced that same week, on 24th May. 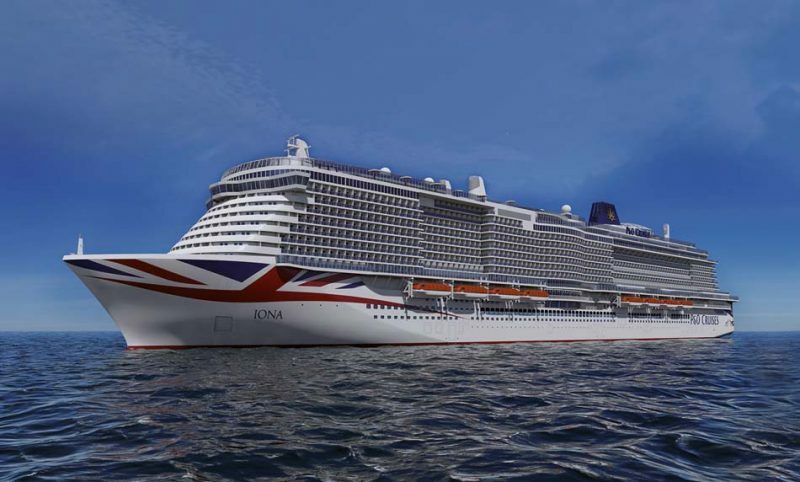 This highly anticipated announcement came as a result of a competition that P&O Cruises ran last year when it invited members of the public to suggest a suitable name for the ship. Over 30,000 submissions were received with a panel of experts made the final decision. The chosen name was Iona, artist’s impression above.